A Utah man killed his wife aboard an Alaska cruise and told an acquaintance who later walked into the couple's blood-splattered room that he did it because she laughed at him, the FBI said in documents released Thursday. Kenneth Manzanares of Santa Clara, Utah, was charged with murder after he was found with blood on his hands and clothes, and with blood spread throughout the cabin on the Princess Cruises ship Tuesday night, according to a criminal complaint by FBI Special Agent Michael L. Watson. 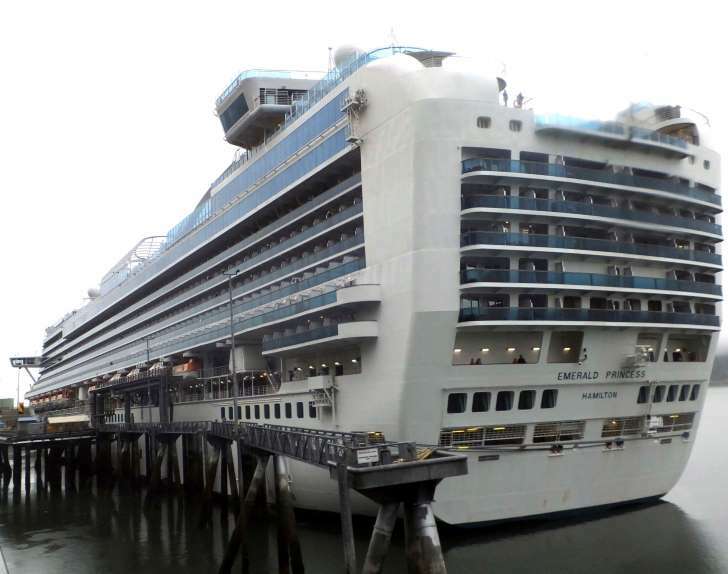 Kristy Manzanares, 39, had a severe head wound, but authorities have declined to release other details in the case, including how many people were traveling with the couple on the 3,400-passenger Emerald Princess that left Sunday from Seattle. A man and other people went into the room before medical workers and security officers had arrived and saw the woman on the floor covered in blood, according to court documents. The man asked Manzanares what happened, and the suspect said, "'She would not stop laughing at me,'" according to the FBI complaint. Manzanares then grabbed his wife's body and tried to drag her to the balcony, but the man stopped him, Watson wrote. The name of the man was not included in the complaint. While the FBI searched him, Manzanares said, "'My life is over,'" the complaint states. Manzanares, 39, participated in his first court appearance Thursday by teleconference from Juneau, where he is in custody. He appeared to be crying at times before the hearing and near the start, when U.S. Magistrate Judge Kevin F. McCoy began speaking. He was wearing an orange jumpsuit during the proceedings. He had his ankles shackled and was wearing slip-on shoes. McCoy appointed assistant Federal Defender Jamie McGrady to represent Manzanares. McGrady was not at the hearing and did not immediately respond to a request for comment. Bail has not been set and a preliminary hearing was scheduled for Aug. 10. A federal prosecutor in Juneau indicated he would seek a change of venue from Anchorage to Juneau. "Kristy was a dedicated and loving mother who juggled her business schedule to make her children the top priority," the statement from Summit Sotheby's International Realty in St. George, Utah, says. The ship was diverted to Juneau because of the investigation, which the FBI is leading because the death occurred in U.S. waters. The ship docked Wednesday and passengers were kept on board for hours before it departed late that night for the town of Skagway. Princess Cruises said passengers will receive $150 onboard credit because of the effect on their vacations.